Udupi, Jan 25,2017: Former CM and BJP stalwart, B.S. 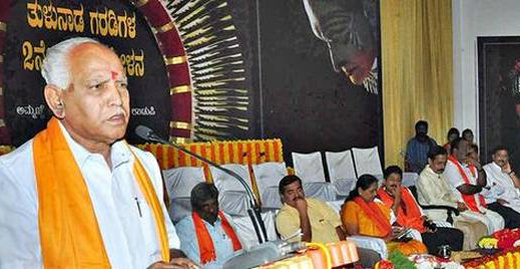 Yeddyurappa, on Jan 24, Tuesday stressed that ‘garodis’ (places of worship) have played an important role in maintaining harmony among communities in Tulunadu. He was speaking after inaugurating the ’Tulunadu Garodigala Mahasammelan’ organised by the Tingale Pratishtana, here. Yeddyurappa said that Koti and Chennai, the legendary heroes of Tulunadu, who were divine incarnations, had promoted social unity. The State government should provide monthly pension to “darshanapatris,” “pambada,” “parava” and others working in the “garodis.” “Our beliefs shape our character. But these beliefs should not become superstitious. We should preserve and promote our culture," he said. He said that he would lead a delegation of MPs of Coastal Karnataka to Delhi to impress upon the Union government about the demand of the people here to allow them to perform the kambala. Shobha Karandlaje, MP, said that some garodis were in a dilapidated condition. Costumes of “Bhootaradhane” should not be used in processions as they formed part of the ritual, she said. Being a politician never give talks based on community because this itself destroys the peace and harmony of the place . Belief should not be superstitious its true , that we shouldn’t believe anything blindly.